Hear from donors who have started their planning. Planned giving donors have historically provided essential resources that have enabled the Diocese of Jefferson City to help underwrite many improvement projects through the years and to establish an endowment. 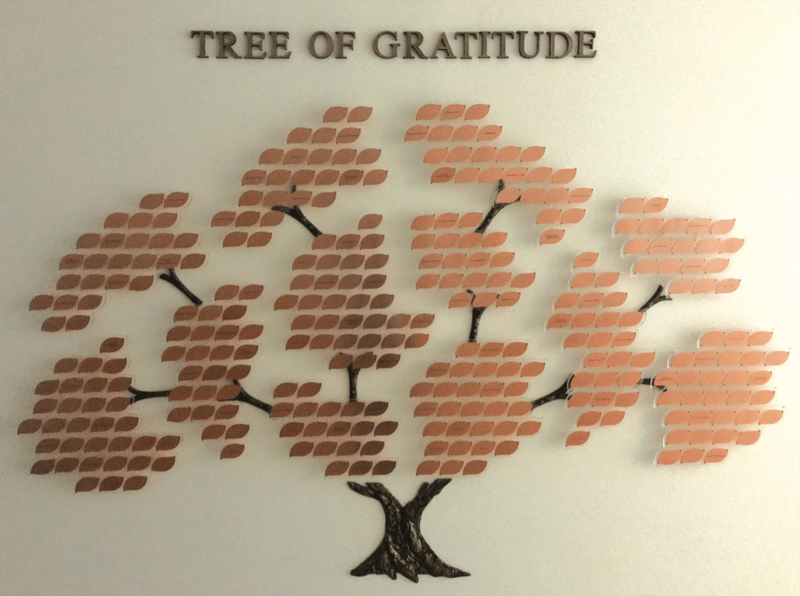 The Tree of Gratitude in Alphonse J. Schwartze Memorial Catholic Center in Jefferson City recognizes and honors those families and individuals who have provided for the Diocese of Jefferson City and all its parishes, through a planned gift. What is a Planned Gift or an Estate Gift? Generally speaking, a "planned gift" or an "estate gift" is a gift to charity that takes effect upon the donor's death. The gift is typically created before death, but the funding of the gift to that charity is postponed until after the donor's death. It is, at its core, stewardship. It simply is your last act of stewardship when it takes effect. Often, a planned gift can represent a family's most impactful act of stewardship, and can leave a positive legacy that lives on well after we are all gone. A planned gift can provide extraordinary opportunities and resources to help the Diocese of Jefferson City carry out its mission more effectively than ordinary resources and revenues could sustain. A planned gift (estate gift) may enable the donor to make a more significant gift than thought possible. In some circumstances, the planned gift can even be structured to allow the donor to enjoy the subject property for his or her lifetime. Thorough planning with knowledgeable advisors (tax accountant and/or attorney) may allow one to achieve philanthropic and estate planning goals without adversely impacting financial well-being. Consider the Diocese of Jefferson City as "one of your children." For example, if there are four children in your family, then specify in the Will that upon death, the estate be divided into five equal parts, one for each child and one fo the Diocese of Jefferson City. Consider an "estate tithe" to the Diocese of Jefferson City. For example, instruct in the Will that after estate expenses are taken care of, the Diocese of Jefferson City is to receive 10% of what is left over, dividing the other 90% between surviving family, other persons, causes or institutions as desired. The simplest way to support the Diocese of Jefferson City or your local parish is through cash gifts. Creative gifts of assets can include stocks, bonds and property (real estate and personal property). Such gifts can provide both charitable deductions as well as other additional tax savings. Make a bequest for a specific asset, such as securities, real estate, or personal property. Sometimes a donor is reluctant to make a gift to the Church because of the worry about having enough income or resources to make it through retirement. Life-income gifts, such as charitable gift annuities and charitable remainder trusts, can provide donors with a lifetime income stream, significant tax savings and the satisfaction of supplying the diocese or local parish with vital, long-term resources. The Diocese of Jefferson City or your local parish can be named as either a full or partial beneficiary of your IRA, 401(k) or 403(b) plan, profit-sharing plans or other retirement fund. Simply complete a beneficiary designation form (available from the plan manager) and submit the form to the retirement plan trustee, manager or custodian. If you name the Diocese of Jefferson City or your local parish, the beneficiary of the retirement account would receive the full amount, free of taxes, thus creating an estate tax deduction for the donor. One of the simplest planned gifts is designating the Diocese of Jefferson City or your local parish as the beneficiary on a bank account or security. This will allow you to use the assets during your lifetime and to give the asset remains to the Diocese of Jefferson City at your death. A charitable trust is a way to serve with current and long-term financial and philanthropic interest. Through a charitable trust, you give cash, stock or other assets to a trust, which is invested an managed by a professional financial institution. Once created, a charitable trust is irrevocable. Charitable trusts take two forms - charitable remainder trust and charitable lead trusts. A charitable remainder trust allows you to designate the beneficiary of regular payouts from trust proceeds for a period of time, not to exceed 20 years or until you die, and to designate the Diocese of Jefferson City or your local parish as a remainder beneficiary. This allows you to claim a tax deduction for the estimated portion of the assets. A charitable lead trust appeals to individuals who wish to make a gift but retain the property. You can designate the Diocese of Jefferson City or your local parish as the beneficiary of annual payments from the trust, allowing you to avoid taxes on the income during a fixed period of time or until the end of your life or another person's life. The Immaculate Heart of Mary Legacy Society honors individuals who have included a gift in their will or made a charitable lifetime agreement to the Diocese of Jefferson City. Faithfulness and charity to the Diocese of Jefferson City can earn people the distinction of becoming a member of the St. John, Apostle of Charity Society. Eligibility for membership is open to those who have contributed a minimum of $25,000 to the diocese within the past 10 years through gifts of cash, real property, securities or scholarships. If you have named the diocese in your will, please let us know. We would like to recognize your remarkable commitment to stewardship. If you are considering a planned gift or are simply interested in learning more about planned giving, please call Jake Seifert at 573.635.9127, ext. 227.